Determine the attribute (in this case, the type of errors to look for). Locate the database or reports in which the attribute can be found. Examine the attribute. Estimate p, the proportion of the population having the attribute. Make the subjective decision regarding the acceptable interval estimate, i. 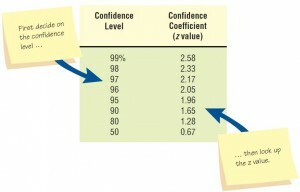 Choose the confidence level and look up the confidence coefficient (z value) in a table. The first step, of course, is to determine which attribute you will be sampling. Once this is done, you can find out where this data is stored, perhaps in a database, on a form, or in a report. It is important to estimate p, the proportion of the population having the attribute, so that you set the appropriate sample size. Many textbooks on systems analysis suggest using a heuristic of 0.25 for p(1 – p). This value almost always results in a sample size larger than necessary because 0.25 is the maximum value of p(1 – p), which occurs only when p = 0.50. When p = 0.10, as is more often the case, p(1 – p) becomes 0.09, resulting in a much smaller sample size. Steps 4 and 5 are subjective decisions. The acceptable interval estimate of ±0.10 means that you are willing to accept an error of no more than 0.10 in either direction from the actual proportion, p. The confidence level is the desired degree of certainty, say, for example, 95 percent. Once the confidence level is chosen, the confidence coefficient (also called a z value) can be looked up in a table like the one found in this chapter. Steps 6 and 7 complete the process by taking the parameters found or set in steps 3 through 5 and entering them into two equations to eventually solve for the required sample size. Determine that you will be looking for orders that contain mistakes in names, addresses, quantities, or model numbers. Locate copies of order forms from the past six months. Examine some of the order forms and conclude that only about 5 percent (0.05) contain errors. Make a subjective decision that the acceptable interval estimate will be ±0.02. Choose a confidence level of 95 percent. 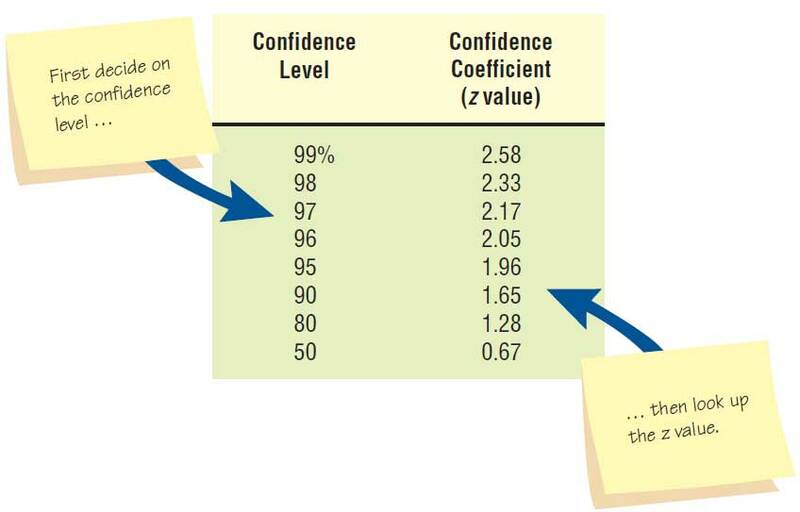 Look up the confidence coefficient (z value) in the figure illustrated below. The z value equals 1.96. A table of area under a normal curve can be used to look up a value once the systems analyst decides on the confidence level. The conclusion, then, is to set the sample size at 458. Obviously, a greater confidence level or a smaller acceptable interval estimate would require a larger sample size. If we keep the acceptable interval estimate the same but increase the confidence level to 99 percent (with a z value of 2.58), the necessary sample size becomes 1,827, a figure much larger than the 458 we originally decided to sample. There are no magic formulas to help the systems analyst set the sample size for interviewing. The overriding variable that determines how many people the systems analyst should interview in depth is the time an interview takes. A true in-depth interview and follow-up interview is very time consuming for both the interviewer and the participant. A good rule of thumb is to interview at least three people on every level of the organization and at least one from each of the organization’s functional areas (as described in Chapter “Understanding and Modeling Organizational Systems“) who will work directly with a new or updated system. Remember also that one does not have to interview more people just because it is a larger organization. If the stratified sample is done properly, a small number of people will adequately represent the entire organization.